Over time, we have developed a unique approach to building bridges and training leaders about the beauty and multi-dimensional potential of diversity - we organise guided cultural experiences, which combine art, music, festive stories and rituals, food and dialogue. Our guests come away with a truly memorable experience, and a deeper understanding of the complexities and opportunities of living and working in multicultural Britain. You are a unique leader in the UK, and we would like to invite you to such an experience, and meet other like minded people from different organisations. Some of the results of our previous tours have been written up in the form of articles and videos which you can find linked here. This is a stunning video on the Oshwal Centre which will draw you into the whole experience. Among the invited people will be politicians, academics, public leaders and corporate executives, and the volunteers of Oshwal Centre will host and welcome us. 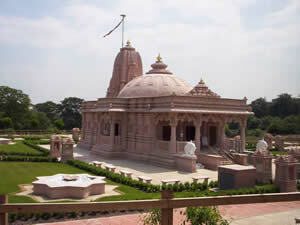 The venue is headquarters of one of the largest Jain communities in UK, the Oshwal Association. You will experience a five hundred year old Ayambil festival, which lasts nine days, and involves prayer and fasting for purification of the soul. The food and recipes are developed in such a way as to give energy and vitality for this quest. The diversity of ingredients and recipes show how deep such a culture is ingrained into everyday life of compassion, service and respect for all living beings. The event is run and managed by volunteers from the community. Here is an article on the historic visit of the MLA Chaired by Sir Andrew Motion. Host: Oshwal Association of UK, address above. Dress Code: There is no code, but smart casual is fine, and ladies should ideally cover their legs. Directions: By car, it is just two miles off Exit 24 of the M25 for Potters Bar. There is plenty of parking. By rail, it is a few miles from Cockfosters Tube station on Piccadily Line, by taxi. Alternatively, Potters Bar Station is nearby. We very much hope you can make it. Kindly RSVP by 10th September 2017.